ho chi minh city in 2 days | take your marks. go. With a jam packed itinerary, we had to be ruthless with our choice of activity and both of us wanted to seek out a gym – Zac was super twitchy about missing his weights, but even I found myself longing for deadlifts. 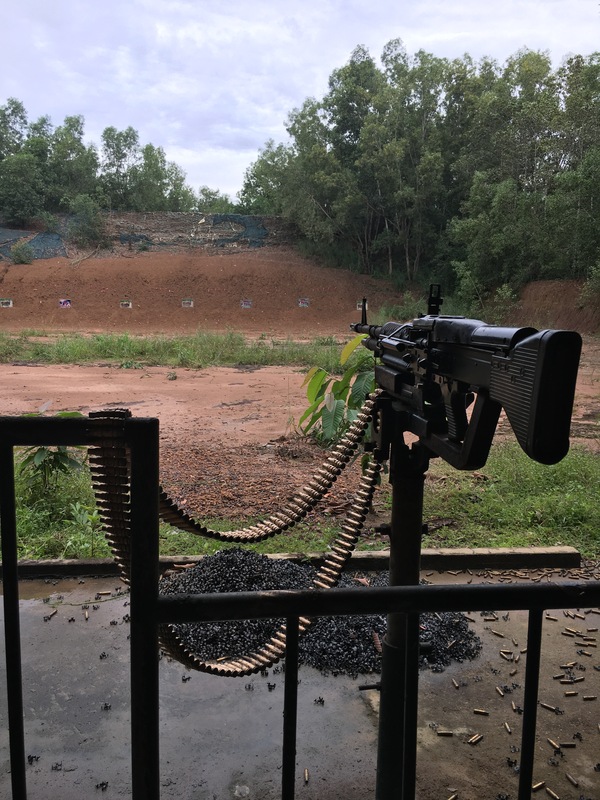 We arrived late afternoon and had enough time to book a tour to the Cu Chi Tunnels the following day before the need to feed overcame us and the weather turned from threatening rain to seeing the threat through. The next morning was an early start; we enjoyed breakfast on the roof terrace, ready for our 7:45am pick up. I’d missed out on my morning caffeine fix so was over the moon to find a coffee stall next to the hotel with an iced cup of joe (cafe da) going for 10,000VND – that’s about 33p. The bus arrived (not before we’d been scoped out by a local for a bespoke moto tour of the city – no way we’re both fitting on that bike mate) and we spent the next half hour doing what felt like 12 laps of the block to pick up our fellow tour goers. 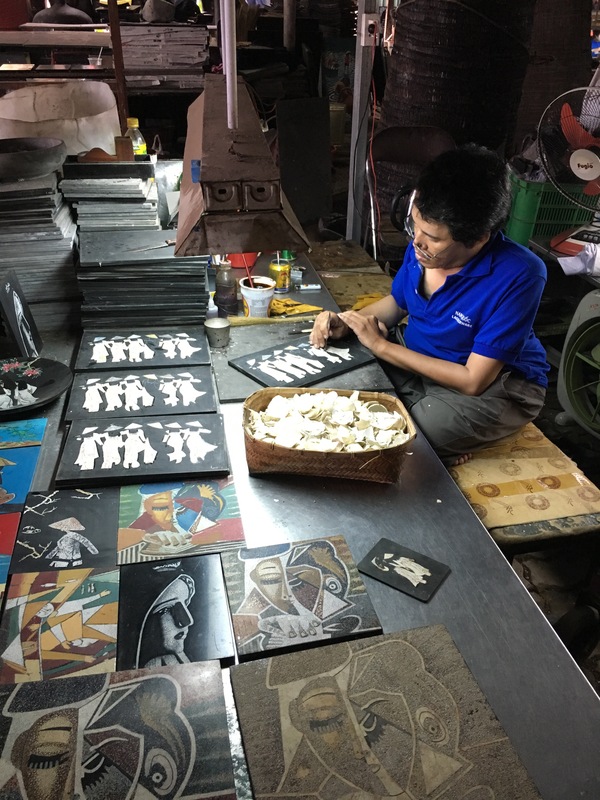 The journey there we stopped at a handicraft market where the ‘Agent Orange People’ flogged their wares. As it turns out, for the privilege of owning your very own ‘Handicapped Handicraft’ you’ll need for fork over hundreds of thousands of dong. Some of the smaller plates were pegged at $70 – the pieces seemed grossly inflated, even with the sentiment behind the project. Empty handed we loitered outside the bus and got chatting to the Kiwi couple on the trip (we keep bumping in to them, don’t we?). Our new friends, Penny and Oly, were on their own big adventure, with their plans landing them in London to work for a few years. Jokes and affectionate scorn at choosing London aside I started grilling them for information about NZ, particularly where was good to live and work – I think I’m still going to settle on Auckland – there’s worse places to hold out while waiting on a visa. We arrived to the tunnels and our guide ‘Mountain’ – as his name is translated to English – began telling us the history of the site in his own special way. It was interesting, and gruesome to see all the weird and wonderful ways the people of Cu Chi came up with to kill America soldiers. Not to say that we haven’t done similarly gruesome things in the throws of war, but the propaganda video shown at the start of the tour was quite intense. Smiling faces of Vietcong Guerillas who had won ‘Hero American Killer’ awards, at least we thinly veil ours with guises of bravery. After our tour of the traps, secret entrances and an overview of life in the tunnels we got to play with guns. Adding a sinister reminder that the tunnels were built with the sole purpose of first destroying the French and then the Americans, the sound of gunfire hits you the moment you walk through the long tunnel to the entrance of the site. Initially it’s a bit unnerving, but it soon fades in to background noise, and it’s quite satisfying when you’re the one making the noise. It’s a minimum buy of 10 bullets, but you can split it between how ever many people you like. We opted for an M16 and had 5 bullets each. I didn’t realise how hot they’d be, and also how far away from the gun they’d fly after you shot them – a few near misses for our delicate toes. I’m still kicking myself that I only made it to the entrance of the tunnels and down the first lot of stairs before the panic and claustrophobia took hold. I was hoping the false bravado that comes from meeting new people who don’t know all your deep dark insecurities would be enough to get me through, but I have to admit defeat and accept I’m claustrophobic. Flash backs to a year 5 caving trip with the school when I was convinced I wouldn’t fit through this tunnel (and was right and had to be forcefully pulled out) and even earlier in my life, playing hide and seek at my Grandparents house, hiding in the underbed cupboard with my cousin and giving up our hiding spot because I overwhelmed with the feeling that I needed to get out. I walked awkwardly past the line of tourists from the rest of our group trying to get in the tunnels, failing to hide the tears uncontrollably streaming down my face. “Claustrophobic.” I responded with a nervous giggle and was met with sympathetic oohs and aahs. Legs shaking and breathing still returning to normal I walked along the trail to the end of the 100m stretch of tunnel open to the public and could hear Zac, Penny and Oly making their way through. I felt a bit better calling out to them. In the end Penny surfaced early, too hot in the tunnels to go on, followed by Zac who was told he’d be too tall for the next part. Oly was the only one who made it the whole way, but by all accounts it was unpleasant. Making our way back to Ho Chi Minh we were ravenous and despite gossiping the whole way, the all important exchange of social media accounts and cooing over nieces, Goddaughters and cakes, we were all doing our best to contain the hanger. Thankfully we stopped outside Ben Tanh Market so we dived in for some super cheap, super delicious street food. After saying our goodbyes, Zac and I somewhat excitedly got changed and headed out in search of Mach’s – a gym he’d found. We were ready to work out 2 months of shoddy diet and inactivity. Turns out, even just doing a light sesh we were a lot further behind than we thought we would be, it was like we were sweating out all the crap from the past few months. Feels less good now, my legs are still complaining. Dinner was enjoyed at a highly recommended spot called ‘Propaganda’ while we planned the following day. I was in love with the decor in Propaganda and Zac had to tell me to stop taking photos of the interiors. He can thank me later when we have a Vietnamese-French inspired kitchen. d.i.y walking tours. ticking off the tourist list. Not wanting to miss out on all the main tourist hot spots, we had a pretty full on walking tour planned and stocked up on water to see us through. If you close your nose, you could be in France…kind of. Heading to the War Remnants Museum, we walked via Notre Dame and The Post Office. A rather unique tact, we experienced our first ‘student swarming’. Skeptical and still scathed from our previous experiences, we weren’t 100% convinced when a young couple approached us to ‘practice their English’. As it turns out, it’s entirely legit, and we were later swarmed by a large group of students, all keen to perfect conversational English. It’s not uncommon to see new brides and their grooms being posed and dragged around this area, as part of their newlyweds photo shoot, and we saw a large wedding party taking advantage of the scenery. Resisting the urge to photo bomb the crap out of their photos, we walked past a nerdy bike gang and on to the museum. Which, incidentally, you absolutely must include in a trip to Saigon. Walking through room after room of haunting war photography and journalism, it was hard not to taste the bitter smack of anti-US teachings. Zac was fascinated with the exhibition by Larry Burrows, and presumably is on a mission to ‘up’ his photo game. For me the hardest part to swallow was the images of the children, generations past still affected by ‘Agent Orange’, of children murdered simply for the sport of it, of mother’s brutalised and murdered along with their brood, entire families wiped out in one fell swoop. The fact that the greatest advances are often born of warfare are a telling symptom of man’s innate need to dominate, that we only seek to better ourselves when there’s someone to beat. It also highlighted some glaring holes in my knowledge of this period in contemporary history – I’ve got some serious reading to do! Truth be told, while it was interesting to walk through the city, marvelling at the French inspired architecture, comparing Vietnam to Cambodia, trying to get our heads around the startling disparities in development and post war recovery, Saigon can be ‘done’ in a few days. Busy days, granted, but in a fast paced city like Ho Chi Minh, it feels like the natural speed. We didn’t feel like we’d missed out on anything and we enjoyed the time we did spend. a wet evening, in a good way. That evening Zac agreed to go to a water puppet show with me. I’d been pestering him for days about it being a ‘must do’ for me when we were in Saigon and was hoping he’d secretly enjoy it more than he expected. I absolutely loved the show, and despite not being able to understand a word they were saying, still found it funny. It was entirely entertaining and fascinating to learn at the end of the show that the puppeteers are actually in the water the entire time, wearing brightly coloured water proof ‘bibs’. My favourite part was at the end when one of the dragons actually breathed fire! But it was all brilliant, from the wonky puppets, to the earsplittingly loud caws and croons from the ‘cast’. And of course a healthy splattering from the stage. Zac compared it to taking me to watch 20/20 in Pakistan and not being allowed to play on my phone or talk to anyone. I knew he probably wouldn’t like it, but I didn’t realise he wouldn’t like it that much!